Bear with me, I need to write this report as much for myself as for anyone else. It was such a marvellous, crazy, hot, rainy, noisy, busy day, it all seems a bit of a blur now! Okay. We reached London on Saturday lunchtime, grabbed some sandwiches and found the hotel. 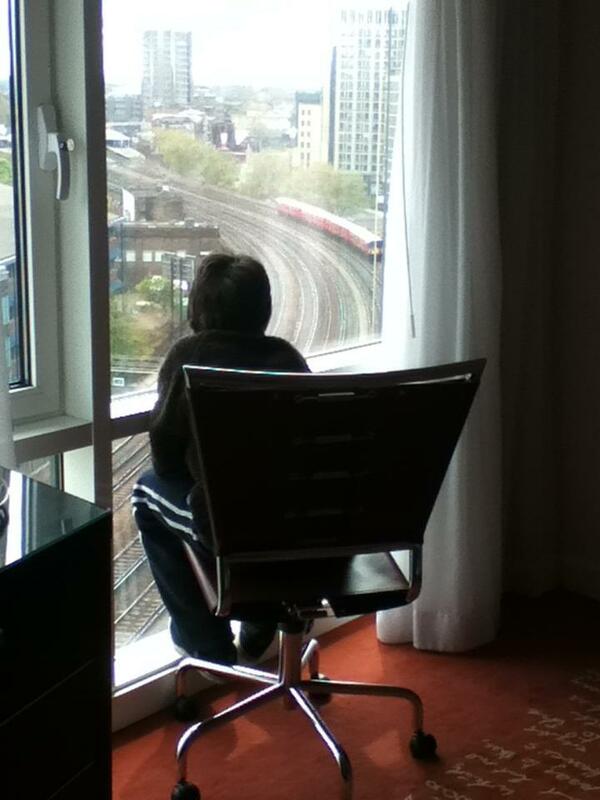 They let us check into the room early which was great, and my son was delighted with the view from the window. Husband, daughter and son decided they were going to head to the Science Museum for the afternoon, whilst I set off to have a walk, stretch my legs and have a ‘recce’ of the finish area. So many inspirational books have advised seeing the finish line beforehand so you can really see yourself in your mind’s eye crossing it. I was a little worried I’d walked for too long, but was great to see the last part of the route, past Big Ben, along Birdcage walk, past Buckingham palace and into the Mall. They were still assembling the finish area but I saw enough to give me little butterflies in my stomach. We met back at the hotel, and headed off for some dinner at a nearby restaurant I’d booked. Guess what – it was an Italian restaurant so I could have pasta! I abstemiously ignored my husband’s lovely looking cold Italian beer and gorgeous smelling glass of Montepulciano (although I couldn’t resist a little taste!) then back to the hotel for a good night’s sleep. Ha ha to that – slept very badly because I woke every couple of hours to check I’d set the alarm on my iPod. Was actually relieved when it was time to get up and just get started. Tiptoed out so as not to wake the others, had a disappointing hotel breakfast so tiptoed back upstairs to make a pot of instant porridge and eat a banana. Got myself all ready, double and triple checked that I had everything, kissed everyone goodbye and slunk out to catch the coach at 7.15am. Its oh so quiet, ssh shh! Managed to queue 3 times for the loo, with the queues getting longer each time. Saw the start of the Women’s Elite race on the big screens, then we were being told to put out kit bags onto the baggage trucks and make our way to the start ‘pens’. I was in pen 9, so right at the back. We all huddled together with some nervous chatter going on, I texted my husband to let him know we were nearly ready, to which he replied they’d just had a delicious, and enormous breakfast and were getting ready to head out for their long day. We never heard the starting ‘horn’, but slowly started shuffling forward towards the Start line. I’d been warned it can take 30 – 40 minutes to cross the line so wasn’t getting too excited yet. I managed to remove my fleece jumper and toss it to the side without hitting anyone this time. We shuffled and shuffled, and around 20 minutes later the Start line was in sight. Read on for Part 2 – the actual race! Previous Previous post: Did it! I am a Marathoner! 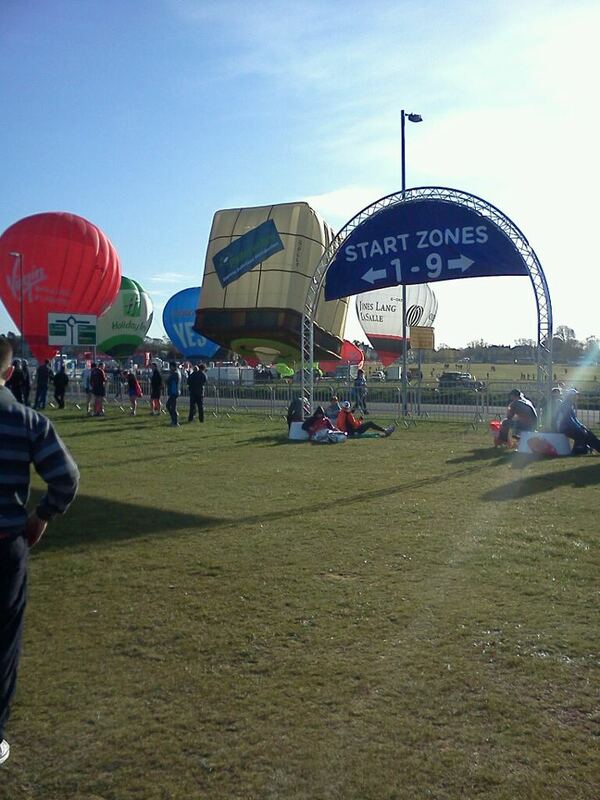 Next Next post: Virgin London Marathon 2012 – Race Report #2 – the Race!